It's a given, we all take things for granted. Although I whined here about the loss of my favorite balsam and lamented the double-whammy hit when my favorite white birch mashed my favorite car, I haven't mentioned my white pine. It is time to pay a little attention to a solid member of the favorite club here at the homestead in Lake Placid. 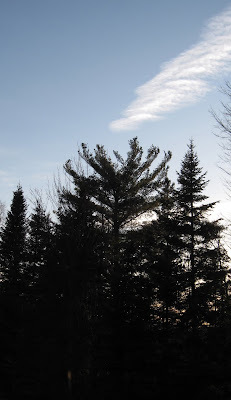 Pictured above, this huge white pine tree is the only one of its species on our 2+ acre wooded property. The top broke off and fell out of it one December about 20 years ago, further testament to the frequency and ferociousness of December storms in the Adirondacks. Although it was a shame to lose the top, the timing was perfect because I use white pine for indoor holiday decorations. My son, Eddie, was relieved that year since he got out of his annual job of climbing the tree with a handsaw to harvest the holiday pine boughs. Before losing its top, the tree stood nearly 100 feet tall. The lone white pine also happens to be perfectly positioned to serve as my balance focus point for living room yoga practice. Focusing one's eyes on a fixed object helps maintain yoga balance poses. The white pine tree occupies a large part of the view out of my living room window, so my eyes naturally drifted to it as I tried my first Tree Pose from that spot, many years ago. It actually suited my practice better after it lost the top since the branches are nice and symmetrical, and mimic the arm positions in many yoga balancing poses. Or maybe the yoga poses mimic the tree branches. In any case, an analogy emerges here in a very natural way, thanks to my favorite white pine. As in one's yoga practice, having a focus also helps maintain balance in one's life, naturally! Below is a shot of the white pine from the practice perspective.